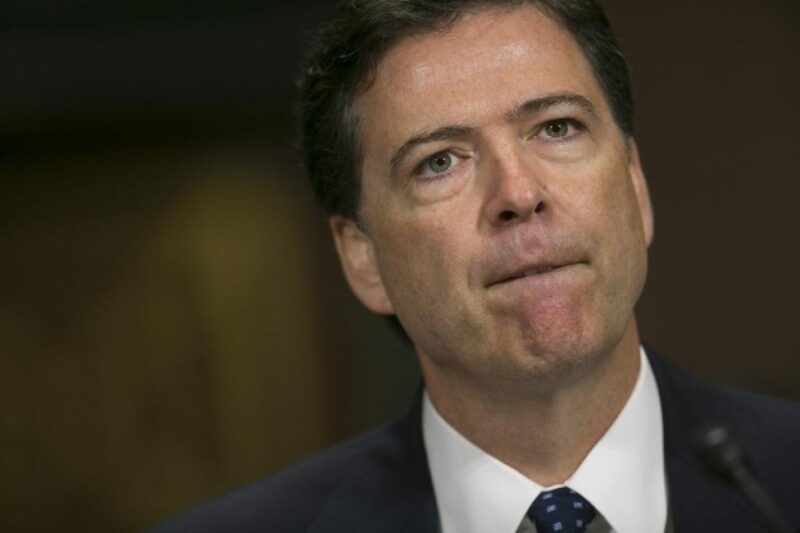 “Federal Bureau of Investigation (FBI) director James Comey said Tuesday at a press conference that he will not recommend an indictment against Hillary Clinton, though he found ‘evidence’ that she might have violated laws pertaining to the handling of classified information. “Comey announced a number of conclusions that support the findings of Breitbart News’ coverage of the Clinton private email scandal, including that she sent and received information on her private server that was classified. Comey said that 110 of Clinton’s emails were classified at the time they were sent. “Comey said that ‘although there is evidence of potential violations,’ no reasonable prosecutor would take on the case. “Comey at least shared details about that damning evidence. “He also said that seven of Clinton’s email chains contained ‘Top Secret’ information. “‘That is excluding any later up-classified emails… None of these emails should have been on any unclassified system, but the presence of these emails is especially concerning,’ Comey said. “‘There is evidence to support a conclusion that any reasonable person in Secretary Clinton’s position… should have known that an unclassified system was no place for that information,’ Comey continued. “‘There is evidence that they were extremely careless,’ he said, referring to Clinton and her aides. “Comey said that ‘no outside influence of any kind was brought to bear’ on the investigation, even though Attorney General Loretta Lynch recently held a secret meeting with President Bill Clinton. Do you not realize that public distrust and disgust with the U.S. federal government is at its highest level since this nation was founded? And are you not willing to admit that there are very good reasons why so many Americans feel the way they do about their federal government? We have watched the federal government cover up fiasco after fiasco. We have watched as our public servants in Washington, D.C., have allowed the privileged class (mostly those in the employ of the federal government) to walk away scot-free from crime after crime–crimes that had any of us ordinary people committed, there would have been absolutely no mercy shown us. Sir, I believe you have attempted to conduct yourself honestly and admirably throughout your long and celebrated career. You have the respect and admiration of the vast majority (if not all) of the agents who serve under you. Many of us very much respected the way you stood on the Constitution and rule of law when President G.W. Bush tried to bully you into executing warrantless searches and seizures and you courageously refused to do so. And we were depending on you to once again speak truth to power and stand upon your oath to the Constitution as you examined the misdeeds of Secretary Clinton. But you let us down. You failed the agency, the American people, the Constitution, the rule of law, and even yourself. You are better than that, and you know it. I’m really not sure how you are going to live with yourself after all of the years of priding yourself as being a man of character, honesty, and integrity. The Clinton crime machine has claimed another victim: James Comey. Yet everyone knows that the classified material that Hillary Clinton carelessly left unprotected (at the very least) did indeed make its way not only into the public but also into the hands of our enemies. And there is no doubt in any objective mind that Hillary’s crimes resulted in the deaths of Americans overseas, including Benghazi. And this is not to mention the fact that the evidence to which you alluded proves Ms. Clinton committed perjury. And, as you know, there are thousands of Americans in prison today who are there for that same crime. Plus, every single day across this great nation, prosecutors at every level prosecute people with evidentiary material that is far more circumstantial than the evidence you found against Ms. Clinton. You know this to be true. With the utmost respect, to suggest that no reasonable prosecutor would take on the case is downright laughable. The only reason that a prosecutor would not take on a case like this would be because of the fear of political and even vocational retaliation. In your public statement you acknowledge that individuals in a similar situation would not necessarily be let off the hook with no charges but would probably face penalties. Sir, by your own admission, you have acknowledged that you have provided special treatment for Ms. Clinton. From the creation of our Declaration of Independence, which we celebrated the 240th anniversary of this past Monday, our country was dedicated to being “a nation of laws, not men.” Granting special favors to officers of the Crown was one of the many reasons that our thirteen colonies fought a bloody revolutionary war to break free from Great Britain. But you know all of this. You were given a position (by God and the American people) that has the authority (and responsibility) to show the world that America is still a nation of laws and not men, that the U.S. Constitution and rule of law is still held sacred in this country. But you brought disgrace to that position and made a mockery out of that uniquely American doctrine held sacrosanct from the days of our Founding Fathers. Do you realize how difficult you have made it for patriotic Americans throughout the country? Whether you realize it or not, there are hundreds of thousands (probably millions) of American people from all walks of life who daily put their lives on the line for liberty and truth as much as any of your agents do. In fact, we help make America safer for your agents. We stand behind the rule of law. We oppose the militant hotheads who would use any misstep or misdeed by your agency (and other federal agencies) as an excuse to inflict bodily harm against the representatives of the federal government. We believe in the divine principles of Natural and Revealed Law. We are men and women of peace. We are willing to stand beside your agents as they serve the people in defense of our constitutional liberties. We believe in law and order. Whether you understand it or not, people like us are the last line of defense between your agents and those who believe that they are a law unto themselves and who refuse to acknowledge the laws of Nature and Nature’s God. And now you have slapped all of us in the face and made our jobs so much more difficult. Plus, you have made it much more difficult for your own agents and given fodder to those who are bent on lawlessness. A majority of the American people (from both ends of the political spectrum) feel betrayed by their own government. And now you, Sir, have joined the seemingly ever-burgeoning cabal of betrayers. I realize had you chosen the valiant and honorable course and rightly recommended that criminal charges be brought against Ms. Clinton that the Attorney General–the partisan lackey that she is–would have in all likelihood ignored your recommendation. You may have even experienced political and vocational retaliation yourself. But at least yours would have been the honorable part. Plus, know that many of your fellow Americans have suffered (and still suffer) such retaliation for being true to their convictions. So, you would have been in good company. Comey acknowledges Hellary violated the law, a violation which is a significant felony but doesn’t suggest that she be prosecuted. What the hell is that S.O. B doing in office? I am SO ANGRY that I would like to do something just as egregiously illegal, but I would go to jail if I did what I would like to do. But of course, I can not! I am only a retired military person, who should know better. But she doesn’t have to know better because she only wants to be the leader of the free world and apparently that doesn’t require intelligence and common sense. But we should have known that too, because Obama is currently the leader of the free world, and we do know that he is lacking in those qualities. Then how did he get elected and how does Hillary-Dillary expect to get elected. The answer: (drum roll) The envelop please. MC- answer to the 64 million dollar question- the Dumbocratic voters are just like their heroes. God help the USA! If you all don’t vote for Trump, the death of the US will be on your shoulders. But you say, I am just not going to vote for anybody. My answer to that, then that is as good as a vote for Hillary and you are as dumb as the rest!!! Praise God and pass the ammunition!!! !